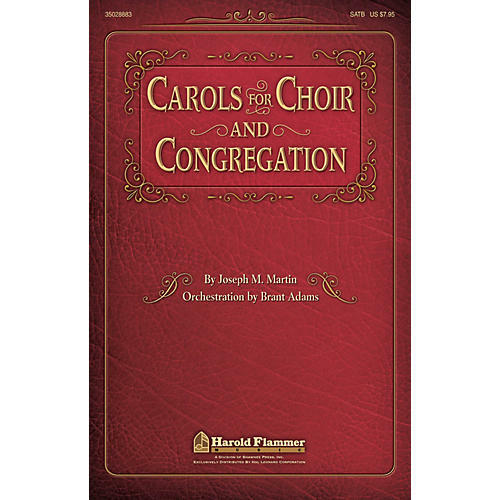 Gathered from of our most successful seasonal cantatas, this compilation of beloved carols is designed to work as choral anthems or for choir and congregational corporate singing. Erase the boundaries between loft and pew by bringing the church body together in the embrace of time-tested Christmas and Advent selections. Fully orchestrated by Brant Adams, these arrangements will lift your sanctuary singing to new heights. Congregants sing along while the choir adds power, depth and harmonic color. The final verses of these Christmas standards are among some of the most inspiring passages you will ever experience. These arrangements will be used year after year for Hanging of the Green gatherings, Lessons and Carol services or for festival hymn singing during the holidays. Available separately: SATB, Listening CD, Preview Pack (Book/CD Combo), Orchestration CD-ROM (Score and Parts for Flute 1 & 2, Oboe, Clarinet 1 & 2, Bassoon, Horn 1 & 2, Trumpet 1-3, Trombone 1 & 2, Bass Trombone/Tuba, Timpani, Percussion, Harp, Piano, Violin 1 & 2, Viola, Cello, Double Bass), Handbell CD-ROM (3 octaves), StudioTrax CD (Accompaniment only).